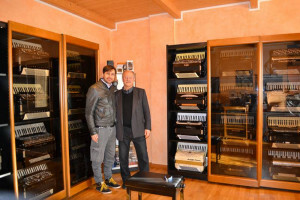 “A young accordion builder cannot fail to visit Maestro Stefano Prestileo’s precious collection of accordions, which unlike many other collectors of this instrument, possesses only original professional instruments built between 1950 and 1965 by the historic great Italian companies and foreigners of the time. The very kind Master did not spare himself in showing me, playing and comparing all his instruments. Analyzing the strengths and rare defects and listening to the sounds, a passionate confrontation between musician and builder was born, for me an important and unique experience to see, touch and above all to hear where our predecessors had arrived, where we are today and where we need to aim for the future of this fascinating instrument. 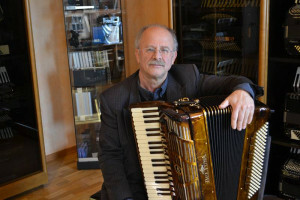 All the fans know that the accordions produced in that historical period had avant-garde patents and construction techniques and above all of the unusual sound qualities and are considered for these reasons the best instruments ever built. It is a great pride for me to find in this precious collection a Beltuna, held by the Master, the only one in modern production worthy of being among those milestones”. Who is the master Stefano Prestileo? I was born in 1955 in Belluno, in the north of Italy, and soon I showed my passion for the music. My father, as a good Neapolitan, used to play the mandolin and the harmonica. When I was 7, I concentrated my attention only on the accordion. That sound, coming from the reed, was able to give me a special emotion and so I began to play it by ear, finding on my own the notes of some popular melodies that I used to listen to with my father. After some time Dad brought an accordion home, and that’s how I soon began studying this fascinating instrument. After attending middle school, in 1970 I started my musical studies at the State Conservatory of Music “Cesare Pollini” of Padua, enrolled in the class of Flute Traverso. At that time the Accordion was not considered as an instrument for study by state conservatories, so I had to choose another instrument and decided that it was to be the transverse flute. 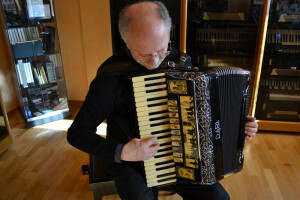 At the same time, however, I continued the study of the accordion, my first great passion. In this period I listened to records that an uncle, fond of Accordion, living in France, took me on the occasion of periodic visits to our family and that I still jealously keep, being recorded by the great French accordionists: Marcel Azzola, Gus Viseur, Joss Baselli, Tony Murena, Andrè Astier, Jo Rossi and many others … all material that at the time was not available in Italy. I owe a lot to this uncle because besides playing the accordion he was also a great connoisseur of this instrument. At each of our meetings he gave me some real lessons on the constructive peculiarities of the various models of accordions. Even my three brothers were playing and in a short time we had formed, together with some musician friends, an orchestra that performed publicly on various occasions. Naturally, I supported the teaching activity with all this, teaching in various musical schools. In 1982 in collaboration with a guitarist friend, I founded a cultural association called “Music Institute”, of which today I am the president, with the main purpose of divulging musical culture. 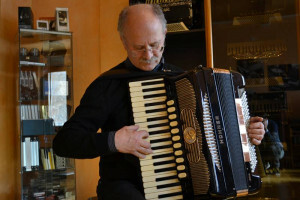 This reality today, after 36 years, has more than 150 members of various instrumental courses, including thirty enrolled in the Accordion school. Of particular importance are the courses for children aged 6 and over, made possible by the use of an accordion designed by me and made by the firm “Tiranti Fisarmoniche” of Castelfidardo, with special construction features and appropriate measures for children. Much attention has also been paid to the quality of the materials and the hand-type reeds and in some also hand-made reeds. Currently I work full-time musical teaching activities at my cultural association the “Music Institute” based in the province of Belluno (Italy). How does this passion come for the accordions of that era? 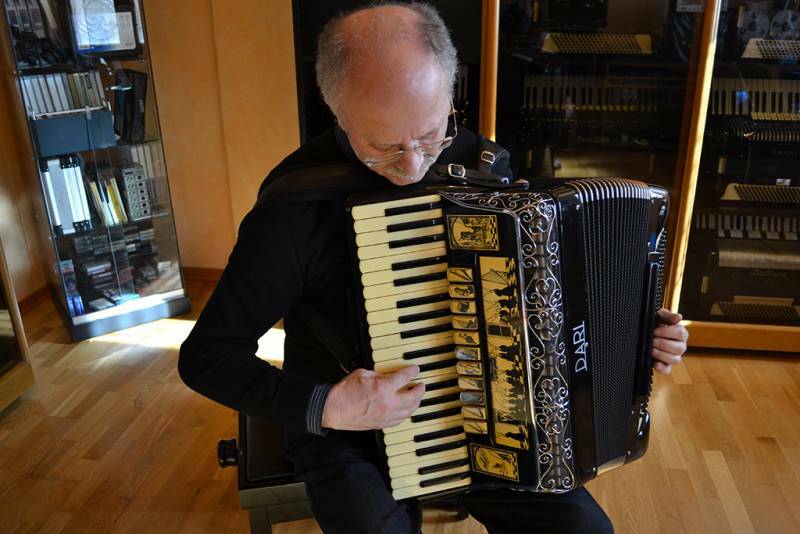 It all started about twenty years ago, when a dear accordionist friend, Maestro Francesco Visentin, let me try his personal Scandalli Super VI, built in the early 60s. At the time I was playing on a ZeroSette mod. B 30 of the early ’70s, a high quality instrument, with very good sound, keyboards and high-end mechanics, but the sound of the Super VI had impressed me particularly for its depth, dynamics and softness, at the same time powerful . From that moment I started looking for it, a very difficult undertaking. In spite of everything, taking various contacts with people in the sector after four or five years I managed to get hold of one of these specimens. Since then my attention and curiosity has been diverted to the accordions built from the early 50s until the mid-60s. Coming into possession of accordions manufactured by the various Castelfidardo companies, in this fortunate period, I was able to realize that they are the best instruments ever built. 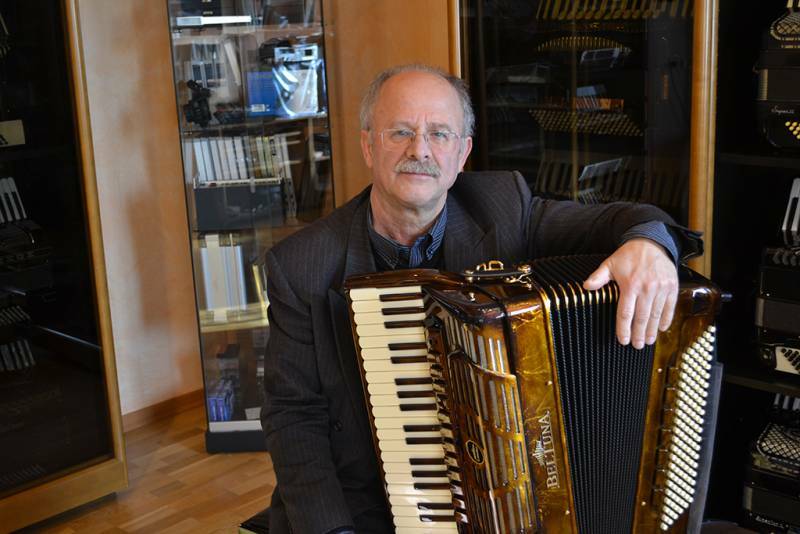 Most of the professional accordions I collected were recovered in the United States of America and in several countries of Northern Europe. Dari, Titan, Victoria, Sonola, Cavagnolo, Giulietti, Zerosette, Fratelli Crosio, Scandalli, Excelsior, Hohner, Dallapè and Guerrini. All these extraordinary instruments are rigorously original and their fine-tuning was taken care of by an equally extraordinary person, a craftsman from Castelfidardo, the unforgettable Vitaliano Morbidoni, the one who tuned the instrument to the most famous French accordionists: Andrè Astier, Joss Baselli, Louis Ferrari, Marcel Azzola and Richard Galliano (to name a few) as well as the bandoneon of the great Astor Piazzolla. I was lucky enough to meet Vitaliano and his son, Roberto Morbidoni, who carries on his father’s work with passion and tenacity. With them over time I have welded a great friendship and they themselves are the authors of some models of accordion with the brand “Vitaliano Morbidoni” that are part of my collection. Instruments that, above all from the sound-tonal point of view, would define as extraordinary. Can you show, for each model, the characteristics that contradicts all your accordions? We could start talking about the Scandalli Super VI built in the late 50s. First of all I believe that the beauty of the sound of Super VI depends on the careful choice of woods and their seasoning (it is said that it could even reach 15 years) and of course the good quality of the steel used in the production of voices (soul of the accordion); no less important is the processing entrusted to the hands of expert craftsmen who took care of finishing, setting and tuning. Another particularity is noted in the construction of the right keyboard: the keys are made of walnut wood, which due to its stability ensures the perfect functioning of the keyboard over time. The reed-blocks are made from a single block, a solid milled maple. The left harmonic box consists of a single piece with a continuous band (section). Another peculiarity can be noticed with regard to the cassotto, which is built in a single block of aluminum, without joints of any kind and an inner side is covered with a thin layer of a material similar to velvet that affects the softness of the sound. These are the main features, then of course other small details make the Scandalli Super VI a unique and inimitable instrument. Now let’s move on to an instrument with very particular and different construction features, I refer to the Sonola SS 4 mod. Ernie Felice, built in the 60s. It is an instrument with only two voices on the right hand, one low and one natural, both playing in a cassotto. The peculiarity is in the fact that the two voices resonate in a second box parallel to that of the normal cassotto, with the result of a surprisingly deep and very soft sonority. An instrument very suitable for jazz music. In terms of Sonola, it is certainly important to name the model SS 20, unlike the SS 4, it is an instrument with four voices in the right hand: a 2 + 2 and in the fifth to the mechanics. The particularity of this accordion lies in the prolongation of the cassotto towards the keyboard. Equipped with Nazzareno Binci voices, it has a very powerful and particularly pleasant sound. Another interesting instrument, from the constructive point of view, is Fratelli Crosio of the late 50s. This accordion has an important characteristic, consisting in the application to the keys of a mechanism for the precise adjustment of levers. This mechanism, developed by Ettore Crosio, allows the perfect support of the valves on the harmonic level. From the sound point of view, the voices are mounted on the skin and spiked: a rather clear sound comes from it, incisive and full of harmonics. We will now take care of the Hohner Gola, another extraordinary instrument, produced by the Trossingen house (Germany) in 1962. 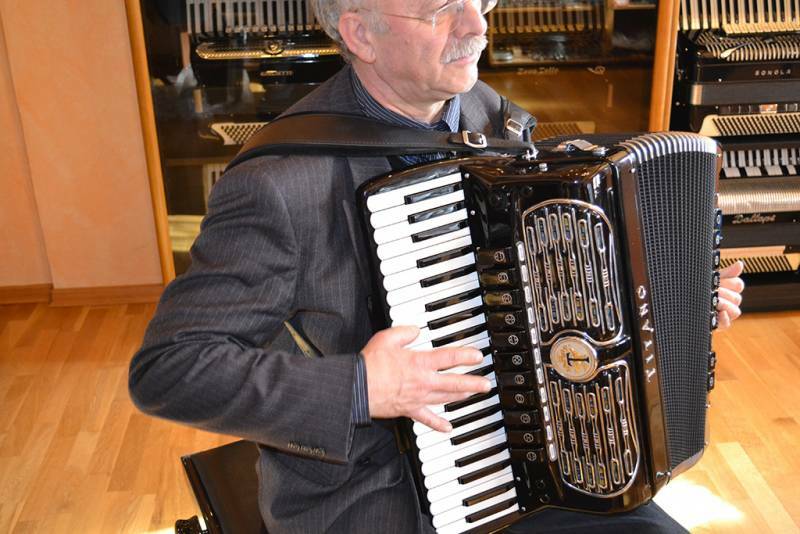 The Gola is ranked among the highest achievements in the accordion manufacturing sector. The instrument was designed by the technical musician and tuner Giovanni Gola di Stradella in 1954. This accordion was requested by the best concert artists of international renowned and is still much sought after today. The instrument is equipped with very soft and precise keyboards. 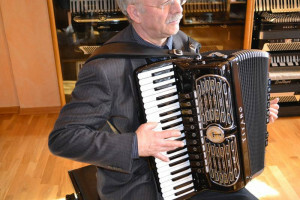 What I have personally witnessed is that due to its size, in a sound position, it is very easy to play; another detail that the players immediately feel is the very low air consumption compared to other accordions. As in all the others of the same period, the sound is naturally very respectable. In the collection there are also several models of the Titano, the model Royal cassotto bass standard, Royal cassotto free bass, Emperor cassotto free bass, Palmer Convertor Emperor flat bottom and free bass, model Orchestra flat bottom standard bass and Virtuoso model flat bottom and standard bass . All of the early 60s and all equipped with Catraro voices, in my opinion of the highest quality and exceptional timbre. Another instrument that deserves to be taken into consideration is the Giulietti model Classic 127 and the Super Model, also from the early 60s. With their voices Nazzareno Binci, they express the best among the accordions of those years. Last but not least, the Cavagnolo model Vedette 10, typical instrument of Vercelli, adopted by the French. Instrument with a bright, if not crystalline sound in its high notes, at the same time deep in the lower part. An instrument that has always fascinated me. In your collection are there some instruments that belonged to famous people or artists? Actually in the collection there is an instrument that belonged to a famous accordionist: the Fratelli Crosio of the fifties, of Louis Ferrari. 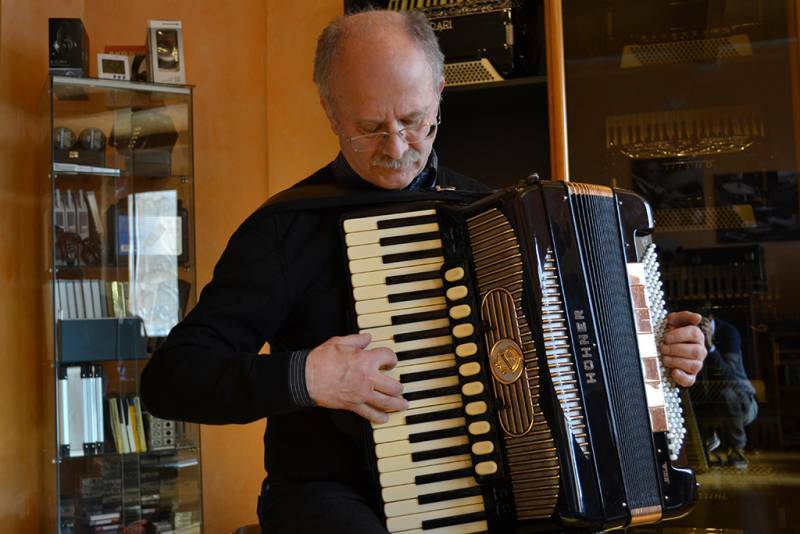 It is an original Crosio, still in excellent condition and with typical characteristics of the Stradella accordions. Are there any artists who refer to you to have a good instrument? In the last two or three years, some artists, coming to know my collection, asked to try these instruments of the 60s. Some young people who had never had the opportunity to have in their hands one of these specimens, were absolutely impressed, especially by the beauty of the sound and the character that distinguishes each of these instruments built by various accordion companies of that era. Each has its own sound identity. Recently the very famous French accordionist Richard Galliano was also interested in an instrument that was part of my collection, strictly from the 60s. In your collection, is there an instrument that is your favourite? To be honest, I find it a bit difficult to answer this question because each of these instruments has a high degree of quality, but for the truth there is an accordion that satisfies me particularly and it is the Royal Model Titano of 1964 with convertor bass system for fifth. In this one, in my opinion, all the main features that any accordion could wish for are summarized. In particular, the timbre of the Catraro voices: a well-defined sound and rich in harmonics, which I would call “magical”, then the mechanics (left hand) play beautifully and is very balanced with the right keyboard, unlike for example the Royal with standard bass, always with Catraro voices, but with the left that is slightly intrusive on the right hand. In conclusion, I consider it a very versatile instrument, which lends itself well to performing different genres. 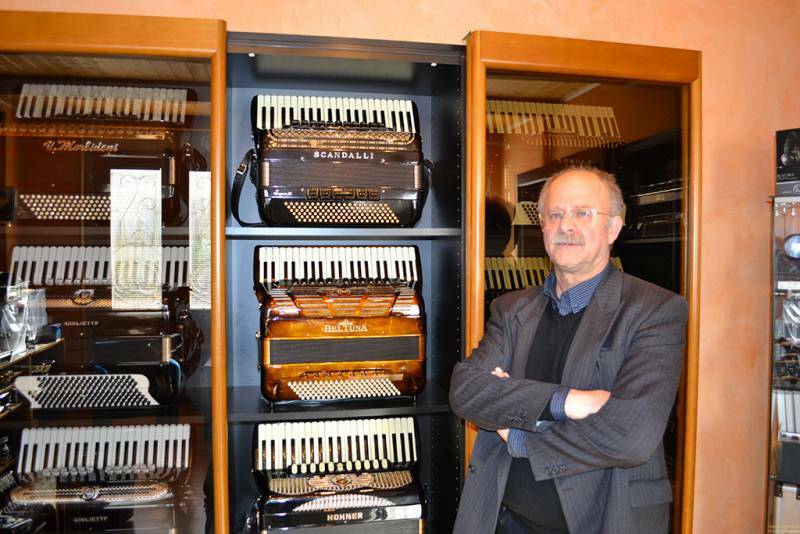 Why is the Beltuna the only instrument of the current accordion production that you inserted in the collection? 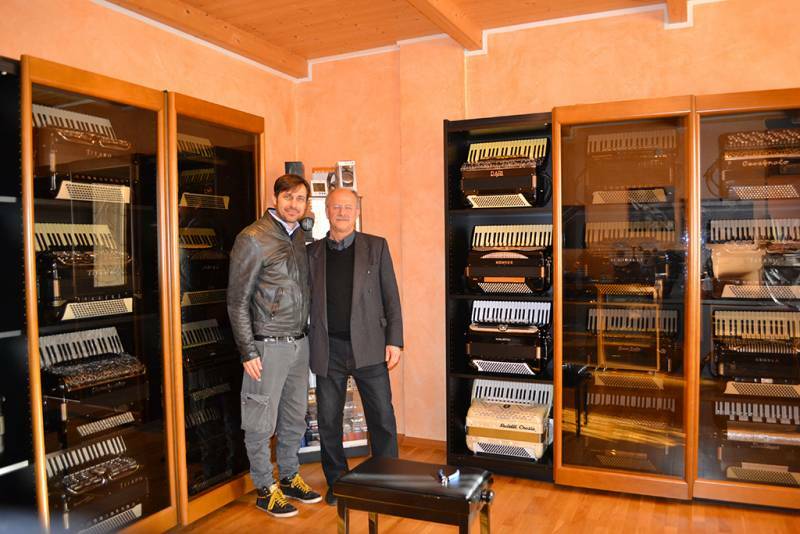 I recently visited the renowned “Beltuna” accordion company. As they will remember (Francesco and his father Arnaldo Mengascini, the owner of Beltuna), during my visit, they were very helpful and courteously took me on a visit to their company. This was followed by a pleasant conversation, with exchanges of opinions regarding the instruments of the 60s and those of modern production. I was immediately intrigued by the fact that in this company there is a lot of research and innovation. Now, we know very well that in the 50s / 60s the best instruments were produced, but in my opinion, we should not rule out the possibility of aiming at a production of accordions that can at least approach these historical specimens. To answer your question precisely, I would say that I have included in the collection a “Beltuna” (in this case the Leader model) first of all for the particular attention paid to the sonic response and quality of the voices. In particular, I greatly appreciated the “Amplisound” patent which, above all, in this model allows you to obtain greater intensity of sound. As for the aesthetic part, I find, without any doubt, that it is a very refined product. 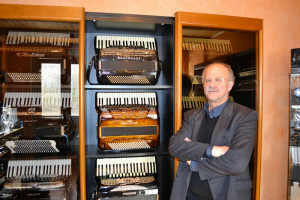 Quality of materials, aesthetic refinement and timbric research make Beltuna a unique instrument in the production scene of modern accordions: this is why it is included in the collection. Is the collection complete or missing anything? I certainly do not have the presumption to affirm that this is a complete collection, I simply believe I have collected a good part of historical professional accordions, of the most famous big Italian and foreign companies of that era.